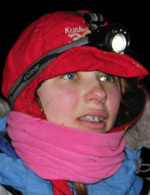 Joan, 17, a senior at Bethel High School, started mushing when she was very young. She says, “My family has seven children and five of the seven have run the Jr. Iditarod. Two have won: Jesica in 2008 and Jeremiah in 2011. We enjoy getting to see all our family friends we’ve made over the years.” Joan finished last year’s Jr. Iditarod in 11th place. At school, she participates in cross country, choir and plays and enjoys art and reading. She plans to attend UAF after graduation and says “yes”, she will continue mushing.